Heims is willing to share the plant with those willing to support one of his favorite causes, the OSU Master Gardeners. 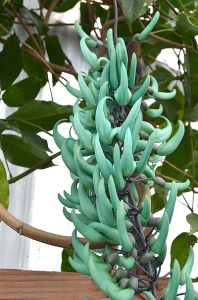 Just $25 will get you your very own Jade Vine in a four-inch pot, with all proceeds going to the cause. If interested, contact Dan at dan(at)terranovanurseries.com. “It’s one of the plants that keeps me in horitculture,” he said. 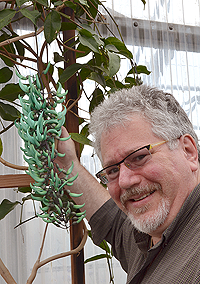 “I love being blown away.” If you purchase one, keep in mind it is a tropical plant and hardy only to 15 C — you either need a greenhouse or to live in the tropics.